An African safari should be one of the best travel experiences you ever have. After all, what's not to love? No matter which destination you choose, safaris by definition involve majestic scenery, incredible wildlife and the rare opportunity to reconnect with nature away from the pressures of everyday life. As with any vacation, though, the people you share your safari with can make or break the experience. To ensure that you're not the one spoiling the fun for everyone else (and in some cases, to ensure your safety), follow our guide to basic safari etiquette. The number one rule on any African safari is to listen carefully to your guide and/or driver. Most guides are highly qualified, with years of training and in-the-field experience. If they tell you to be quiet, it may be because they have spotted something that you can't yet see and don't want to scare it off. If you're on a walking safari and you encounter a potentially dangerous animal, your guide may tell you to stop, stand still or avoid eye contact - for your safety, it's best to follow their advice immediately. Out in the bush, your guide is the expert. It's his (or her) job to keep you safe but they can only do so with your co-operation. Whether you're on a guided game drive or a self-drive safari, getting out of your vehicle for a bathroom break or a better photo is usually forbidden. This is for your safety - because even if you can't see a lion or leopard in the vicinity, it doesn't mean they're not there. Rhinos, buffalos and elephants may also feel threatened or challenged if you try to approach and are more than capable of inflicting serious injuries. There are exceptions to this rule (designated viewpoints, game-viewing hides and walking trails, for example) but these will be well signposted. Obviously, if you're on a guided walking safari, this rule doesn't apply. Don't expect to see the Big Five on your first game drive - remember that this is the wild and not your local zoo. Your guides will do their utmost to find every animal on your wish list, but there's no guarantee you'll see everything. Parks and reserves are vast, the animals are unpredictable and they all wear camouflage. Make sure you communicate what you are interested in and what you may have seen on previous drives to better your chances. The best way of making sure you're never disappointed is to take an interest in smaller animals and insects as well; while becoming a birder opens a whole new world of potential sightings. If you've been on safari before, don't keep regaling others with your knowledge or superseding the guide when he is explaining something. It can get annoying very quickly. Also, try not to boast too much about what you've seen when back at camp (or what you saw on your last safari). You can easily make other guests feel like they've had a lesser experience. It's also important to respect your fellow passengers' wishes to stop and look - you may be blasé about zebra but for some, they're still a novelty. Also remember that no matter how many times you've done it before, there's always something new to discover and appreciate. A safari is a social activity. You'll probably share a vehicle with other guests and many camps encourage communal dining at the end of the day. There's plenty to talk about and plenty of time to talk. But on a game drive or nature walk, bear in mind that animals have exceptional hearing and will often move away if they hear human voices. If you spot an exciting animal first, try to alert everyone calmly and quietly so that they have a chance to see and photograph it before it moves on. Lastly, avoid the temptation to try and get a better photo by shouting for an animal's attention - you'll either scare it away or aggravate it. In the past safari etiquette dictated that you left your cell phone at home, but nowadays many people use their phone as their primary camera. So, if you plan on bringing yours with you, make sure it's on silent. There's nothing more effective at spoiling the magic of the wilderness than an abrasive ringtone - or even worse, someone discussing their latest business deal or romantic saga at the back of the safari vehicle. If you do have a conventional digital camera, try to mute that as well. The constant beeping as you delete images or turn your camera on and off is just as distracting as a lively WhatsApp chat. This one applies to individual game drives and to your entire safari vacation. 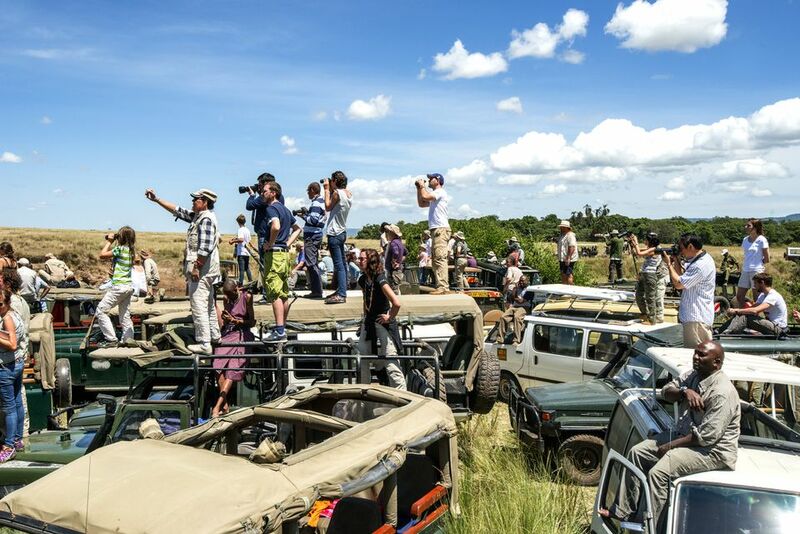 In the game vehicle, space is limited and you should only bring the essentials - your binoculars, your camera, a bottle of water and adequate weather protection. When packing for your holiday, bear in mind that charter flights in and out of remote safari destinations have very strict luggage allowances. There are lots of ways to save space. Pack clothes that can be washed and dried quickly then worn again, limit yourself to one set of hiking shoes and a pair of sandals and load books onto a Kindle rather than packing heavy paperbacks. During your time in Africa you will meet many local people and it's important to be aware of cultural differences. When talking with your guide about sensitive issues (like apartheid in South Africa or the Rwandan genocide) it's best to listen rather than assert your own opinion too forcefully. English is a second language for most Africans so don't be surprised if some of what you say is lost in translation. In fact, it's common courtesy to try and learn a few basic phrases of the local tongue - your efforts will be much appreciated. If you visit a tribal village, never take photos of people without asking first. It's easy to forget that only a tiny percentage of what you pay for your safari goes to the people who work hardest to make your experience so special. Your guide, driver and camp staff will all get a modest base wage and rely on tips to augment their salary. Knowing what to tip can be difficult and the best thing to do is to ask your tour operator for guidelines before you go. Otherwise, tip what you think is fair in relation to the level of service given and the local cost of living. It's customary to tip in local currency but US dollars are usually appreciated as well. If you plan on self-driving, remember to tip gas station attendants and car guards. Last but certainly not least, don't forget to take every precaution necessary to stay healthy on safari. Several weeks before departure, remember to ask your doctor which vaccinations you'll need for your chosen destination. You will probably need to take anti-malaria pills as well (malaria is endemic throughout most of East, Central and West Africa and in many parts of Southern Africa). Vaccines and malaria medicine are not always readily available and may need to be ordered from elsewhere in the country. Your packing list should also include a basic first aid kit so that you can treat any minor injuries or illnesses on your trip. This article was updated and re-written in part by Jessica Macdonald on December 15th 2018. Is Going on Safari Dangerous? Have You Heard of Malaria-Free African Safaris?